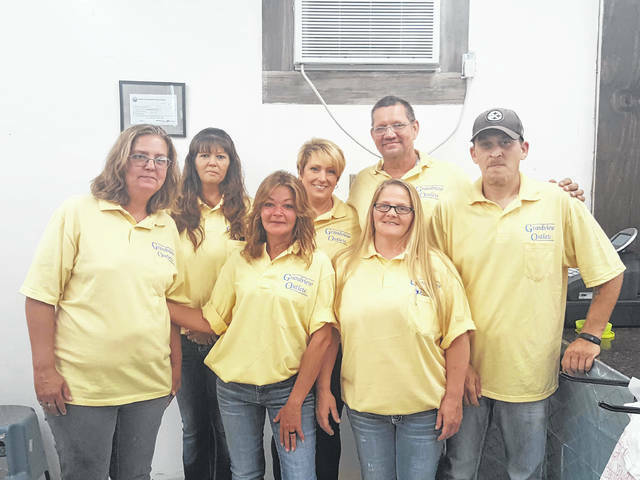 Grandview Outlet of Middleport employees (front, from left) Alice Brown (Area Supervisor), Tina Backus, Store Manager Kenda Reynolds, James Kennedy, (back) Misty Ross, Tracy Moon and Stephen Hays. MIDDLEPORT — There is a new business in town. After being empty for the past several years, the former Vaughan’s Super Market building in Middleport is now home to a new store. Grandview Outlet opened its doors this past week on the food side of the building, with the home goods portion of the store expected to open in the coming weeks. Area Supervisor Alice Brown explained that local employees Kenda Reynolds (store manager), Tina Backus and Stephen Hays, along with Grandview employees from South Point and Peebles, have been working to prepare the store from the floor up for the new business. They have installed flooring, painted walls, stocked shelves and many other tasks to get the business ready to serve the community. Currently the store has non-perishable food items, paper products and other items are discounted prices. “Our goal is to keep the prices low to help the people in the community,” said Brown. Grandview Outlet is open 10 a.m. to 6 p.m., Monday through Saturday and 11 a.m. to 5 p.m on Sunday. Grandview Outlet has several stores in the region, with the main location in South Point. Grandview Outlet in Middleport will host an open house style event from 11 a.m. to 1 p.m. on Saturday, with an official grand opening to take place in the coming weeks. https://www.mydailytribune.com/wp-content/uploads/sites/42/2018/06/web1_6.28-Grandview_ne2018627101323292.jpgGrandview Outlet of Middleport employees (front, from left) Alice Brown (Area Supervisor), Tina Backus, Store Manager Kenda Reynolds, James Kennedy, (back) Misty Ross, Tracy Moon and Stephen Hays.